Find out more about this rare condition which can affect several organs in the body. The term ‘amyloidosis’ is a general term used for a group of conditions where an abnormal protein, called amyloid, accumulates in the tissues. The build-up of amyloid protein is called an ‘amyloid deposit’. Deposits can occur in various organs or tissues and cause problems. Different types of amyloidosis are named according to the type of amyloid protein which is produced. All begin with the initial ‘A’ which stands for amyloidosis. The ‘A’ is followed by one or more other letters, which identify the particular amyloid protein. For example: AL amyloidosis, AA amyloidosis and ATTR amyloidosis. The ‘L’ in AL amyloidosis stands for ‘light chain’. Light chains are normally part of healthy antibodies (immunoglobulins), which are produced by healthy plasma cells. In AL amyloidosis, however, abnormal plasma cells in the bone marrow produce light chains that form amyloid proteins. The amyloid protein is only broken down very slowly by the body and so starts to build up in the tissues and organs. This gradually damages them and causes symptoms. This build-up can happen almost anywhere in the body; each patient has a different pattern of amyloid deposition, with different organs affected. AL amyloidosis can be treated but it is a relapsing-remitting condition. This means you can have periods of remission after treatment, when the AL amyloidosis is not active or causing symptoms, but it will become active again after a period of time. Although the amyloid deposits in AL amyloidosis are not themselves cancerous, the condition may occasionally be associated with a cancer called myeloma. Regardless of whether or not you have myeloma associated with your amyloidosis, the treatments for AL amyloidosis are similar to those for myeloma. If it’s suspected you have AL amyloidosis, you will be sent to the National Amyloidosis Centre (NAC) in London for a combination of tests. Some of these tests are done mainly to confirm a diagnosis and are rarely repeated; others will be repeated to monitor the condition. We don’t know what causes AL amyloidosis. It’s likely to be a combination of genetic and environmental factors. AL amyloidosis can cause a number of symptoms and affect the body in several ways. This is because the amyloid protein can be deposited in almost any organ in the body. The symptoms you have will depend on which organ or organs are most affected by amyloid deposits. Most patients will have more than one organ affected by amyloid deposits. The organ that is most affected is referred to as the ‘dominant organ’. Not everyone will have all or any of these symptoms and complications. Supportive treatments are commonly used to relieve and, in some cases, help prevent these symptoms and complications. Treatment for AL amyloidosis can be effective at controlling the condition, reducing symptoms and improving quality of life. Unfortunately, however, AL amyloidosis is currently incurable. Current treatment aims to kill the abnormal plasma cells that produce the amyloid protein. This can help to prevent new deposits forming. There are a number of different types of drugs available to treat AL amyloidosis and they are often used in combination with each other. Depending on your general fitness and age, you may be offered high-dose therapy and stem cell transplantation (HDT-SCT). You can find out more about this by downloading our High-Dose Therapy and Stem Cell Transplantation Infoguide. Treatment can give you a period of remission, where the AL amyloidosis is not active or causing symptoms. However, after this time you are likely to relapse. This is when the AL amyloidosis becomes active again and you will need further treatment. At relapse, you may be treated with the same combination of drugs as before or a different combination. Alongside the treatment for your AL amyloidosis, you will be given other treatment to control and alleviate the symptoms and complications caused by the amyloid deposits, and for the side effects of the treatment. This is called supportive treatment. Supportive treatment includes anti-emetics (anti-sickness drugs), antibiotics and diuretics (water tablets). An AL amyloidosis diagnosis will affect every patient differently, and there is no right or wrong way to feel. Initially you may feel overwhelmed. As you come to terms with your diagnosis, you may feel a mixture of fear, anger and frustration. Sometimes you might feel totally in control of your feelings and at other times strong emotions may catch you unaware. It’s normal to have ups and downs. You may find that changes you need to make as a result of your AL amyloidosis, such as reducing or stopping working, also affect how you feel. However you’re feeling, it’s important to recognise your emotions and work out how to cope with them. You may find that your relationships change as you and those around you deal with your diagnosis and the changes it may bring. 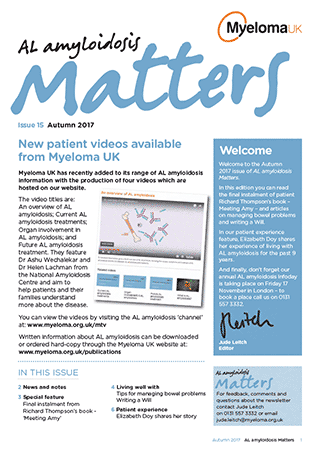 Support from your healthcare team, family and friends, and Myeloma UK can help you to cope with AL amyloidosis. Living well with AL amyloidosis is possible. It can be wearing and frustrating to live with the side effects and complications of AL amyloidosis and its treatment, however, there are ways you can help to manage them. Eating a healthy and balanced diet can help to keep your energy levels up and aid recovery after treatment. It is vital that as an AL amyloidosis patient you limit your liquid intake to no more than 1.5 litres a day and have a low salt intake to prevent fluid overload. Gentle exercise can help boost your mood and reduce fatigue too. Remember, you can still enjoy holidays and travelling with AL amyloidosis by doing some extra planning and taking sensible precautions. Learn about starting a support group in your area.